October is proving to be a pretty big month for the Nokia smartphone brand. Last week, it announced the Nokia 7.1, and next week it’s expected to introduce the Nokia X7 (7.1 Plus) in China. But according to new information, it seems the company may have a third device up its sleeves. Just over a week ago HMD Global confirmed that it would be holding an event in India tomorrow. Subsequent teasers have hinted at a new device with a “mega display,” something many assumed to be the Nokia 7.1 Plus. However, a new image obtained by Smartprix suggests that this is not the case. 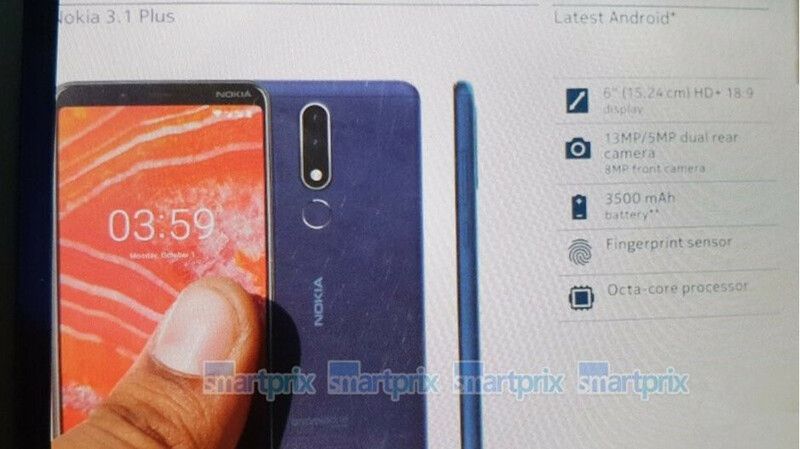 In actual fact, it seems HMD Global will be announcing the Nokia 3.1 Plus. Unlike the company’s other Plus models, the Nokia 3.1 Plus doesn’t include a notch. Instead, Nokia has opted for a more traditional 18:9, 6-inch panel complete with reduced bezels above and below. Taking a peek at the rear, an aluminum build does appear to be present. This is adorned by a rear-facing fingerprint scanner and a new dual-camera setup which makes use of a main 13-megapixel camera and a secondary 5-megapixel depth sensor. While on the topic of photography, an 8-megapixel selfie sensor is also present. Internally, an unspecified octa-core MediaTek processor is included. Unfortunately, neither the RAM count nor the internal storage are detailed either. Regardless of this, a respectable 3,500mAh battery is included, as is stock Android 8.1 Oreo as part of the Android One program. Buyers should, however, expect an update to Android 9 Pie in the near future. Whoa! HMD is attacking the lower end of the smartphone market nicely with this Nokia branded smartphone. Low to upper midrange is HMD's bread and butter, and they surely are making sure that they compete strongly there. so confusing.... nokia 3.1, 7.1, 7 plus and so on.. Nokia , there is a thing known as "FLAGSHIP" please do the honors . Not really confusing at all, if you look at it like one looks at the iPhone 6/6plus, 6s/6s plus, 7/7 Plus.... HMD will drop a flagship when the time is right, but you can't blame them for focusing on the low to upper midrange segment * the smartphone market. It is the bread and butter of even the largest Android OEM's, like Samsung and Huawei. I disagree. The iPhone naming only got slightly confusing since the introduction of the X. This 2.1,3.1,7,7, 7 Plus,7.1, 7.1 Plu, etc.... is a just a bad naming strategy . They should have just stuck with whole integer numbers. It is even more confusing if they gonig to reintroduce "series" designation as well, like the X-series. Then we just disagree with each other. I don’t find any of this confusing at all. The 7 and 7.1 go together, 7 Plus and 7.1 Plus go together, etc. X-Series is specific to China, so those in China don’t have to worry about the other naming strategy, while the rest of the world doesn’t have to worry about the X-Series. Pretty simple to me.